A couple of days ago I published Nfield.SDK to NuGet. In this blog post I want to describe the steps that are involved. Obviously this process will equally apply to publishing / consuming any other software library or package using NuGet. Me and my colleagues at NIPO Software are building the next generation data collection platform called Nfield. Nfield has an open source SDK that market research offices can use to streamline and automate setting up their research projects. 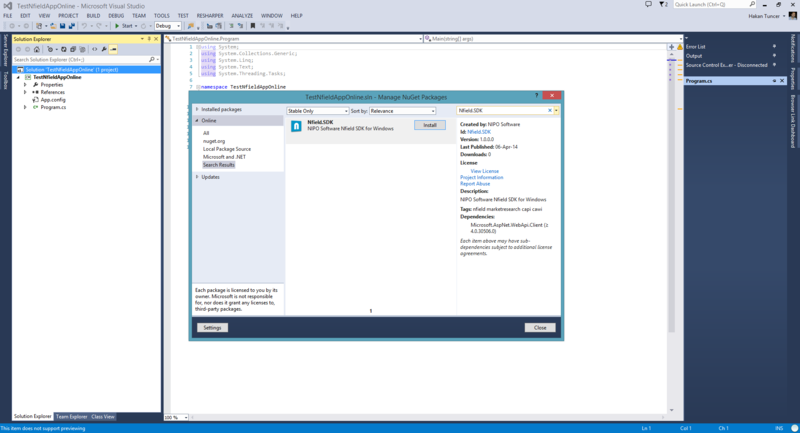 If you're a .NET developer or familiar with Microsoft development environment you probably know what Nuget is. 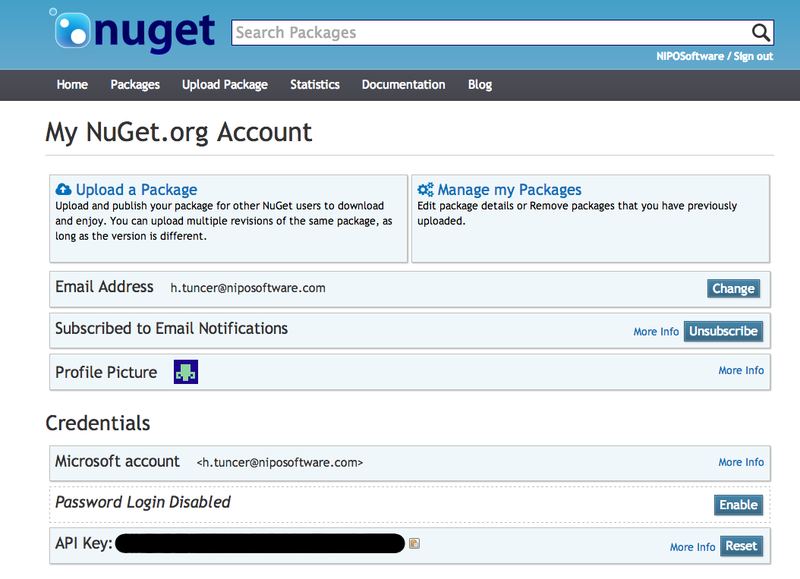 Nuget is an open source package manager for Microsoft development platform (including .NET). Package management systems make poor developers' lives rock (well almost). It eases everything about installing libraries and managing dependencies. It also opens up lots of automation possibilities - like integrating dependency management into the build process. The home of nuget is www.nuget.org. Most platforms have their own package management systems. Ruby has RubyGems, Node.js has npm, Apache has Maven and it works with multiple platforms but it's primarily used by the Java community. Package managers don't only exist in the context of software development. There are also system-wide package managers to install components and applications for operating systems. For more information check out Package Management System and List of Package Management Systems on Wikipedia. When it comes to Git I have a couple of ways to interact. I either directly use the Git commands from a shell or GitHub for Windows and lately I'm also very happy with the Git integration of Visual Studio 2013. In this case I'll just go ahead and use GitHub for Windows to clone Nfield.SDK to my local repository. After cloning is finished, now all files are on my local repository. .nuspec files are XML manifests which describe nuget packages. A .nuspec manifest is used to build a nuget package and it's also stored inside the package after the package is created. There is a .nuspec reference in nuget.org. So whenever we want to create a nuget package, we first need to create a .nuspec file. Nuget.exe command line utility allows us to create .nuspec files from .csproj files. You can also create a blank .nuspec file but pointing to an existing .csproj file makes things a lot easier since it's automatically detecting some of the metadata for us. After running this nuget command NField.SDK.nuspec file is created for us under the same directory. First thing you'll notice is the variable names that start and end with a $ sign. In the next step, when we generate the actual package, the package generator will be told to grab these metadata from the assembly information. For a moment, I thought ignoring the iconUrl entry in the .nuspec file would not be a big deal but I was wrong. After running the same nuget pack command one more time, the package is successfully created. Now I have my nuget package file waiting to be published. Or wait... maybe I should test it before publishing it to the public NuGet repository. There is a way to create a local package repository on the local file system of the machine and test the package using this local nuget repository. But because this blog post is getting longer than I expected I will save it for another day. Let's assume that I've tested the Nfield.SDK nuget package and I'm ready to publish it. 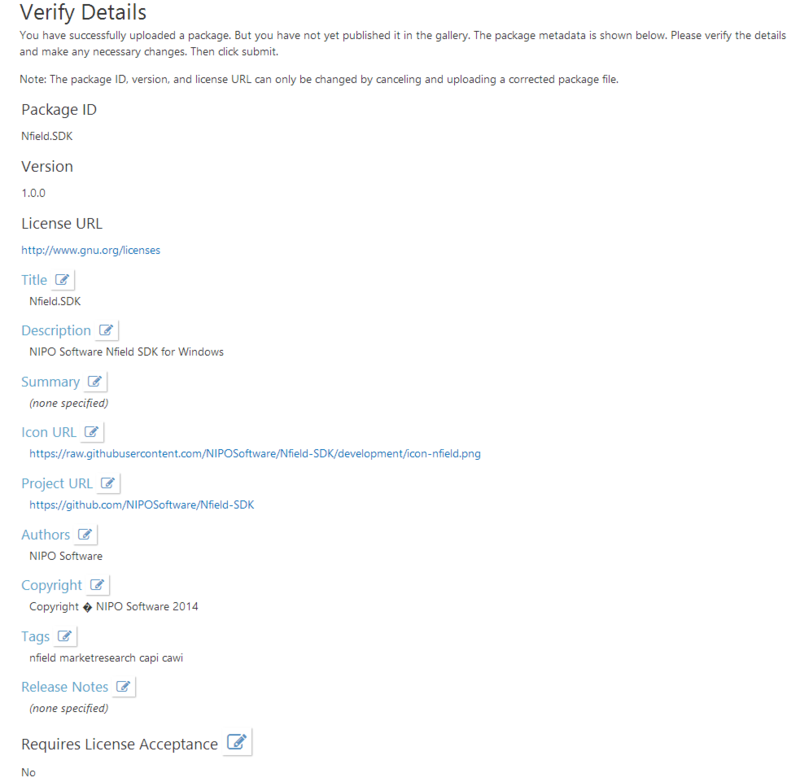 First thing that is necessary is to get the long due NIPO Software account on nuget.org. 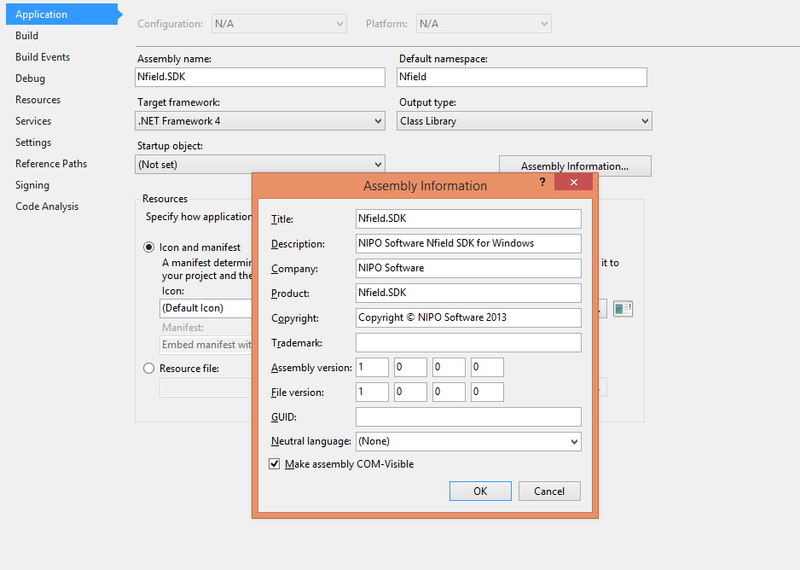 Checkout the screenshot below from nuget.org account page of NIPO Software. Two big buttons on the first row tells me that I can upload packages using nuget.org and I can also manage my existing packages. The other interesting information is the "API Key" at the bottom. This is a GUID that can be used from the nuget command utility. Using this key it's possible to publish nuget packages from the command line without signing in to nuget.org. I took the other approach and directly uploaded the package using nuget.org web interface. After I uploaded the "Nfield.SDK.1.0.0.0.nupkg" file, nuget.org asked me to verify the details of the package before clicking publish the last time. All seems fine for now and I click publish. The package is published for the world to see. 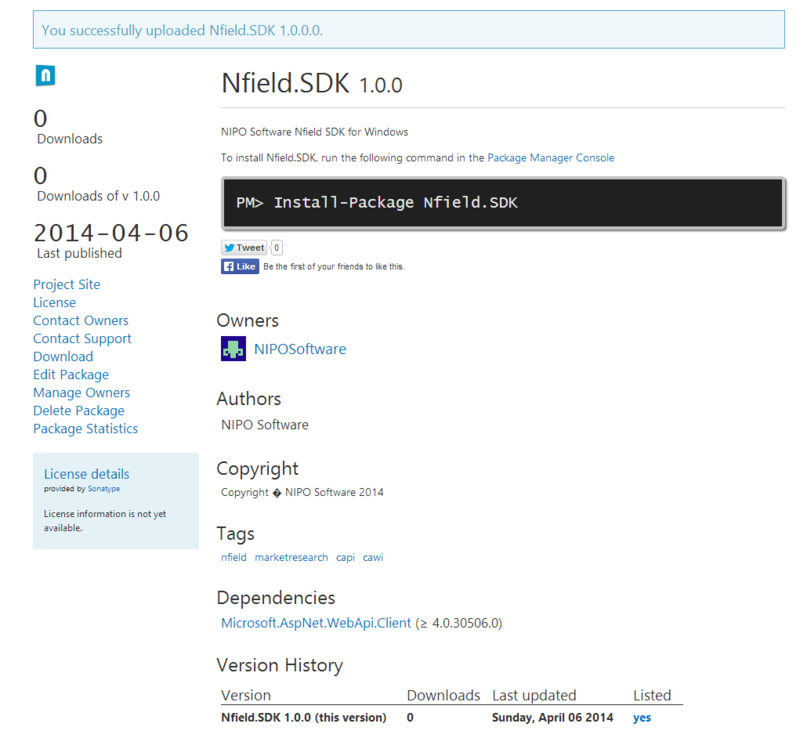 Below you see the Nfield.SDK page from the NuGet Gallery. Using "Install-Package Nfield.SDK" command from the VS Package Manager Console will install Nfield SDK to your project. Also notice near the bottom there is a section called "Dependencies". 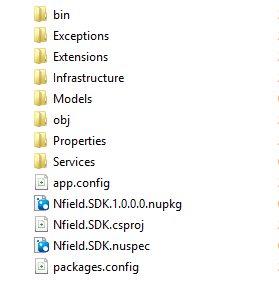 Nfield.SDK depends on one other nuget package and it's visible here. This was automatically handled by nuget when I created the package using the .csproj file. 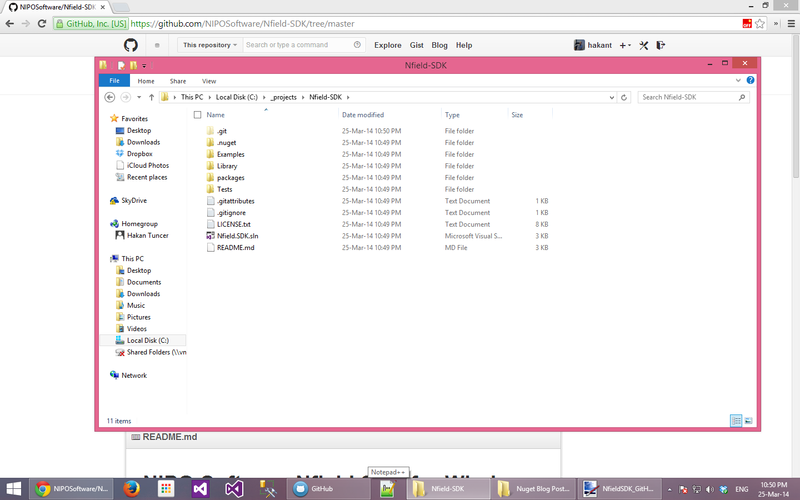 So now as a final step, let's go to Visual Studio and find Nfield.SDK in package manager. 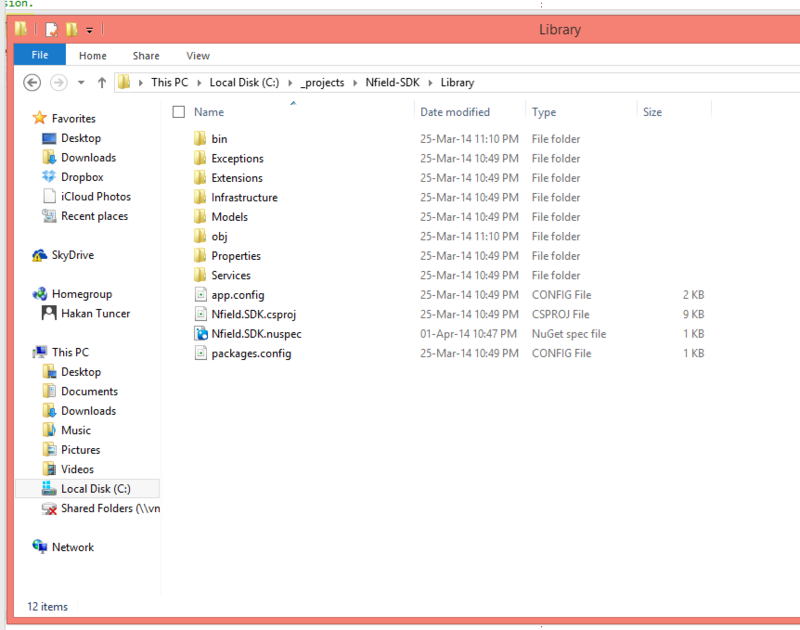 Searching for Nfield brings me the Nfield.SDK package. Here is a screenshot right before I installed Nfield.SDK for my Nfield test project which I will discuss in my next blog post. 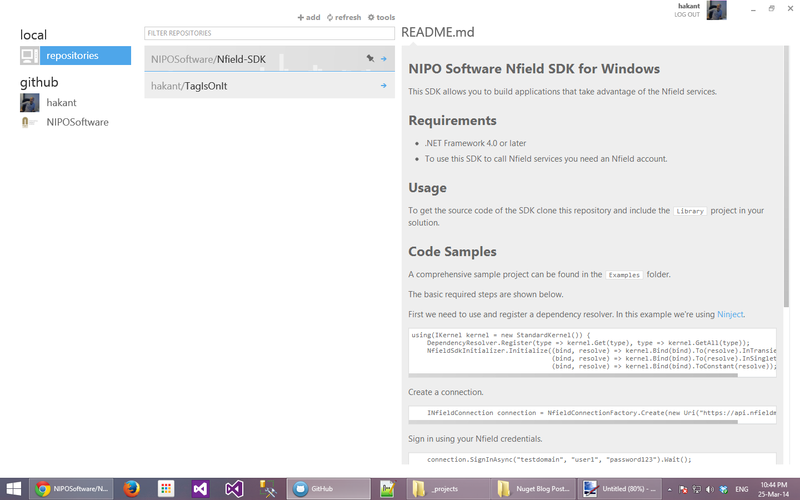 Now that Nfield.SDK is online on NuGet, I can easily install and access it from my own projects. In the next blog post I'll show you how you can install Nfield.SDK and use it to do something useful - like adding an interviewer to your market research office.